OzHitch... Innovative Caravan and Trailer Hitches!! The self aligning cradle takes all the hard work out off the traditional pin variety hitches. The 2 angled edges and the centre slide make easy work of getting the hitch halved together and lined up to connect with the Connecting Pin. (Watch the video). 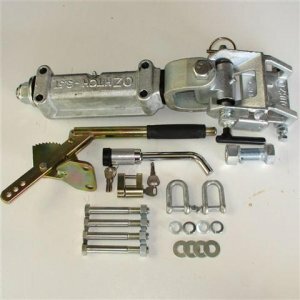 This trailer hitch and caravan hitch is suitable for vehicle up to 3.5 ton GVM. This practical on road and offroad hitch can be used for almost any box trailer, caravan or camper trailer. This affordable hitch is ideal as an easy and quick retro fit to all 184 x 54 bolt centre hitches, such as the Alko units.